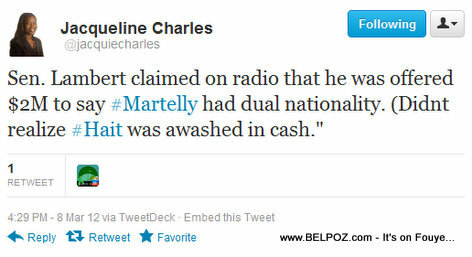 Jacqueline Charles Tweets: "Sen. Lambert claimed on radio that he was offered $2M to say Martelly had dual nationality. (Didnt realize Haiti was awashed in cash." Jacqueline Charles is the Caribbean Correspondent for the Miami Herald.